Three ways to maximize a small space - Calgary Property Management | Emerald Management & Realty Ltd.Calgary Property Management | Emerald Management & Realty Ltd.
With more than four decades of experience in the arena of property management, Emerald Management & Realty Ltd. maintains a range of condominium, commercial and residential properties in Calgary, Canada. Emerald Management & Realty Ltd. encourages residents and tenants to decorate their spaces to make them feel more at home. For those living in small spaces, home decorating can seem daunting when trying to maximize every square foot. However, with a little creativity a small space can be attractive, comfortable, and functional. 1. To maximize the space of a small home, consider purchasing pieces that can be used in multiple ways and that offer storage. For instance, some kinds of ottomans can be used as either a footstool or a coffee table while doubling as storage for blankets or other items. 2. When considering furniture purchases, make sure to measure the space before shopping to determine the correct size of your new furnishings. Buy items that actually fit the space; otherwise they overpower the room and make it look even smaller than it already is. 3. Finally, don’t forget about vertical spaces. Pieces that extend toward the ceiling, like bookshelves, lighting, and art pieces, redirects the focus of the room and can make the space appear more spacious. Taller shelving can also provide additional storage and added functionality to a smaller space. Whether you live in a cozy studio apartment or want to get more out of a small room or cozy nook, these simple three tips can help create the feeling of more space regardless of the size of your home. 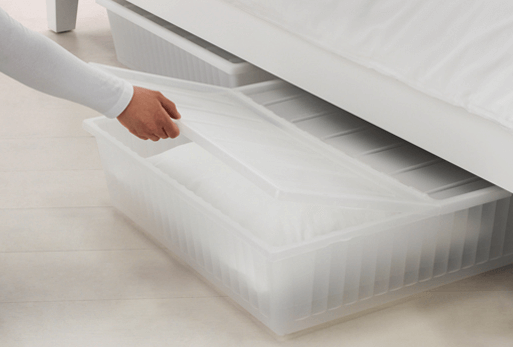 IKEA Bed Storage provides a functional solution by keeping items tucked away but still close at hand (photo credit IKEA).